The European Union has put into effect a complete ban on the sale of cosmetics developed through animal testing. The ban applies to all such products, no matter where in the world they come from. This means no cosmetics tested on animals can be sold in any of the 27 European Union countries. This is a very good decision by the E U. 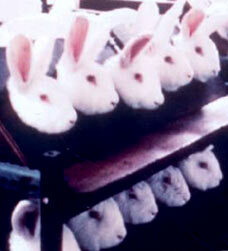 This is high time all the other countries followed suit and imposed a blanket ban on testing cosmetics on animals. All the nations of the world need to go cruelty free as far as testing cosmetics on animals is concerned. In fact, cruelty inflicted on animals in any form must stop now. The human race has tortured and exploited the animals of the world enough already and need to stop this game of blood, violence and greed immediately. In the stone age, we did not know farming and had no options for food except killing animals and eating them. But now we have hundreds of options for food and we kill and eat animals just for taste. Killing and eating a living being just for taste is outrageous. Imagine of a situation where humans start killing and eating one another just for taste! Enough is enough. As custodians of the planet, it is our moral obligation to give protection and love to the animals of the world. The earth belongs to them as much as it belongs to us and we have no right to kill and use them for personal gain and gratification.